A lot of camcorders record .mod videos. Some of the most popular camcorders like Panasonic and Canon record videos in this format. This also means that editing these videos is more complicated than editing mp4 or avi formats. Luckily for us, there is a solution. A bad side is that it is a bit more complicated. However, you need a short practice and a few programs. As you already know, one of the most powerful programs for editing videos, on Mac computers is iMovie. Sadly, it doesn’t support .mod files. It may open some mod files, but you cannot edit them. As aforementioned, a mod file cannot be imported into the iMovie. This means you will have to convert it in a format that iMovie supports. There are several, free, programs on the Internet that will do this. Sadly, this also means you will need more time in order to complete your project. The only, another solution is to buy a camcorder that can record in some format that is supported by iMovie. Step 1 Add MOD files. 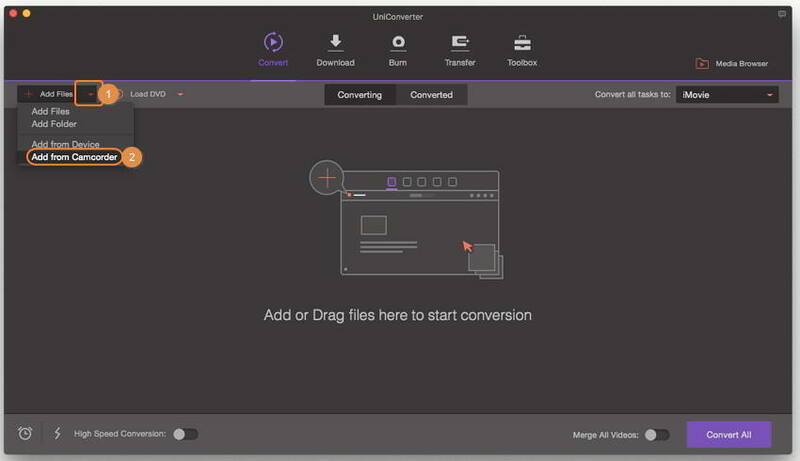 Download and install Wondershare UniConverter (originally Wondershare Video Converter Ultimate). Then, connect your camcorder to a computer and launch Wondershare UniConverter (originally Wondershare Video Converter Ultimate). 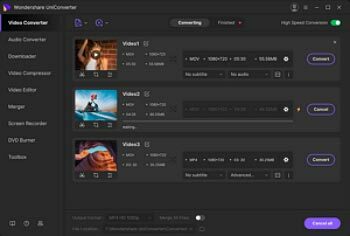 It will automatically show and check all mod files on your camcorder. All you need to do is to click the inverted triangle beside Convert all tasks to and then select Add from Camcorder, check the ones you want to convert and click Add to Convert List to load the files to the program. Step 2 Choose the output format as iMovie. Click the inverted triangle beside Convert all tasks to and click Editing > iMovie, choose the resolution as you want. Step 3 Start converting MOD to iMovie. When you are done, you should click Convert All at the bottom right corner. This process may last a few seconds or several minutes, depending on the size of your files. When done, you can see the target video in the Converted tab. It takes just a few minutes to convert videos that have a size of several gigabytes. Do not interrupt the process. Even if there is a problem, so your computer reboot, your progress will be lost and you cannot use those files. If you are doing this on your laptop, make sure it is plugged in, so your battery cannot drain. Step 4 Import converted MOD files to iMovie. When Wondershare UniConverter for Mac (originally Wondershare Video Converter Ultimate for Mac) completes all tasks, you will see the converted files in the destination folder. You should know that you can choose the destination folder by yourself. Now, you can add files to the iMovie. All you need to do is to click on File >Import > Movies. They will be added to the program. Now you can edit them and save them when you are done. Now, iMovie can edit files without a problem. You can change aspect ratio, add effects and etc. with the iMovie. iMovie cannot open .mod files. Some of the biggest camcorder manufacturers use mod format. Sadly, Apple devices don’t support it. Also, there are many programs that can open mod files. A mod file is a type of MPEG2 video file format. It isn’t naturally supported by Mac computers. A solution may be to modify the file in M2V, so a Mac computer can recognize it. A lot of developers offer their programs in order to solve this problem, however, many of them have flaws. The best way to import and edit mod files in iMovie is to convert them with Wondershare UniConverter (originally Wondershare Video Converter Ultimate) and then import them into the iMovie. There are several other ways to edit mod files. Sadly, most of them doesn’t work properly. You will lose time and money. Using Wondershare UniConverter (originally Wondershare Video Converter Ultimate) is the safest and the fastest option. Even professionals use this program. You must try it and see how fast it is. If you are in a rush, Wondershare UniConverter (originally Wondershare Video Converter Ultimate) is the perfect program for you. Also, it isn’t expensive and you can have support any time you want. As you may know, it is supported by Mac and Windows. Downloading and installing it is simple and it doesn’t require any special knowledge.